← The Gift Guide: Homer’s Odd Isn’t He? Laguna Beach Trad is in festive spirits and recommends a little bit of danger. But then he has always been a bit Byronic in my opinion. ‘Mad, bad and beautiful to know.” All in the best possible sense of course. Christmas 2008 is almost here. And not a minute too soon. I have had enough of grim political and economic developments. It’s time to focus on more sublime pursuits, such as spending time with one’s loved ones, talking and laughing, eating and drinking. With that in mind, for those of us who like the odd cocktail or four during the holidays, the next few weeks should prove particularly agreeable. Should you encounter me on Christmas morning with a blissful look on my face, it won’t only be because I got a new J.Press tie, a new pair of Marcoliani socks, or the complete set of A Bit of Fry & Laurie on DVD . It will be because I finally received a set of Hand Blown Pontarlier Absinthe Glasses from Simon Pearce in Vermont. 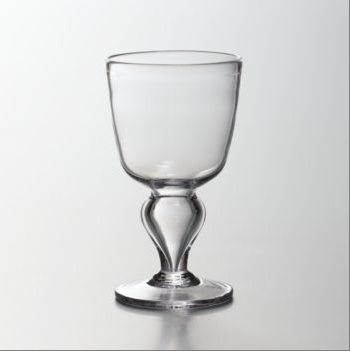 The key to Simon Pearce absinthe glasses is not only that they are beautiful, but also that they are extremely sturdy, which is the first law of absinthe accessories. Drinking absinthe can be a dangerous business and it is no place for crystal frippery. If by Christmas evening I should be found running naked across the neighbour’s lawns singing the Gilbert & Sullivan ballad “I’m Called Little Buttercup” in a threatening manner, rest assured that I have been deriving full enjoyment from my Christmas gifts. Joyeux Noël! This entry was posted in 2008 Holiday Gift Guide and tagged 2008 Gift Guide, Absinthe, Admiral Cod, Gilbert & Sullivan, Laguna Beach Trad, Simon Pearse. Bookmark the permalink.